The Infiniti LE Concept, which makes its world debut at the 2012 New York International Auto Show, is more than just the latest in the series of dramatically styled, technologically advanced concepts from Infiniti. Though sharing much with the stunning futuristic Infiniti concepts that have come before – a sweeping aerodynamic body, an elegantly intelligent interior, inspired driving performance and advanced next-generation technology – the Infiniti LE Concept is more grounded in reality. A production version is expected to reach Infiniti showrooms in near-similar form within the next two years as Infiniti’s first zero emission luxury sedan. From inception, the LE Concept has been designed as a pure Infiniti, rather than as an electric vehicle with luxury appointments. The vehicle is also substantial in form – about the same overall length as an Infiniti G Sedan – supporting Infiniti’s belief that zero emission does not have to mean small. The Infiniti LE Concept does not compromise either roominess or comfort, which is why it starts with an advanced luxury-styled sedan body, not a converted hatchback. The LE Concept’s dramatic exterior blends distinctive Infiniti design cues, such as its double-arch grille and crescent-cut rear-pillar, with EV aerodynamic efficiency to create a sleek, emotional silhouette. The strong shoulder line, which directs the eye from front to rear, expresses a dynamic, elegant flowing movement. The beautifully balanced proportions represent an efficient dynamic form as a new definition of luxury. A number of design features contribute to the coefficient of drag of 0.25, which aids driving range, including the aluminum-alloy wheels with aero treatment, the high rear deck, rear aero diffuser and aero side fin spoilers with integrated illumination. The large front grille features a solid finisher and a charge port hidden under the illuminated center Infiniti emblem. The deep-skirted front fascia includes an aero fin spoiler with illumination. The iconic Infiniti LED headlights and taillights echo the design direction of Infiniti’s recent Infiniti Essence and EMERG-E concepts. Special illumination located under the rear diffuser illustrates the positioning of the wireless charger. The already dramatic exterior is accentuated by blue LED lighting that flows around the lower panels. Distinctive Infiniti EV Blue paint is adopted to enhance the sense of Infiniti EV-ness on the door handles and wheels. The Infiniti LE Concept’s efficient EV platform maximizes interior space by placing the batteries under the passenger compartment floor. This positioning helps provide a low vehicle center of gravity for enhanced handling and maximizes trunk room, without compromising front or rear seat passenger legroom or comfort. Beyond its advanced packaging, the real beauty of the interior design is its “smart hospitality” – combining a luxurious Infiniti environment with next-generation instrumentation, driver interface and connectivity. The LE Concept interior is anchored by its Infiniti signature double-wave layout, which flows seamlessly from instrument panel to the center console and down the cabin sides – embracing driver and passengers in a generous, energetic space. The double-wave design is highlighted by special soft LED Infiniti EV Blue lighting that flows in two waves from front to back, while the center console forms a strong anchor line that penetrates the interior space. The center console finisher adds a touch of EV-ness though use of a “Hamon” (ripple) design. A sculpted shift knob comfortably controls the LE Concept’s drive system. Infiniti-EV meters combine modern digital display and timeless analog gauges, creating an atmosphere of both exclusivity and futuristic design. The center cluster features an innovative connected twin display powered by an Intel Atom™ processor. The twin display will offer Infiniti LE drivers access to the kinds of information that EV drivers will appreciate such as a dynamic range calculator that will use onboard and cloud based data. As the public charging station network expands, the on-board database will be kept current. And on compatible charger networks, the driver will be able to confirm real time charger availability. The elegant, bolstered seat and door trim design also comes from traditional roots, inspired by the “Eriashi” (collar) of a Japanese kimono. The seats are covered in a suede-and-mesh fabric with violet accents, and semi-aniline leather sides. The unique interior color combination of blush violet for upper portions and light white for lower also reinforces the vehicle’s Infiniti EV-ness. 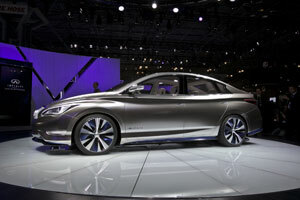 As a fusion of hospitality and Inspired Performance, the Infiniti LE Concept is designed to stimulate, not sedate. Targeting “impressive EV acceleration without sacrificing the range,” the engineering team behind the LE Concept’s e-powertrain sought a silent, smooth response for both accelerating from a start and re-accelerating, such as merging onto freeways or changing lanes. Torque of 240 lb-ft is instantly available immediately at all times. The Infiniti LE Concept’s battery system is a proven laminated 24 kWh lithium-ion (Li-ion) design with a ChaDeMo DC50kW quick charger. The Infiniti LE Concept’s connectivity to the outside world includes the next generation of Infiniti Connection features, such as Infiniti Personal Assistant 24-hour concierge service, navigation, and POI search. The IT system, which includes a large twin display, is easy to operate. The twin display offers drivers all of the information they want, displayed in the right place. The system can also be used to pre-heat or pre-cool the vehicle at pre-set times, synchronize with web calendars and search for local charging stations. The system will be capable of reserving charging stations at public venues such as malls or ballparks (once the appropriate infrastructure is in place). In terms of charging, the Infiniti LE Concept is equipped to utilize an integrated charging port, a DC Fast Charge option and an advanced Wireless Charging System. The system’s non-contact charging is via inductive energy flow, with a coil safely encased on the garage floor. The primary coil is connected to the energy source, which then creates a magnetic field that excites electric current in a second coil in the LE Concept. The high-frequency charging, controlled by the twin display or smartphone, is safe for children and pets and can be installed easily in a home garage. In addition, taking inspired technology a step beyond, the Infiniti LE Concept features an Intelligent Park Assist with Around View™ Monitor to easily align the vehicle in the proper position over the wireless charging coil. The system uses e-steering, with full forward and backward capability, along with a 360-degree view of the surrounding area. It also bookmarks the parking place in GPS so that once the vehicle enters the garage, for example, the navigation system will automatically switch to Around View™ Monitor and the system is ready to park the car.